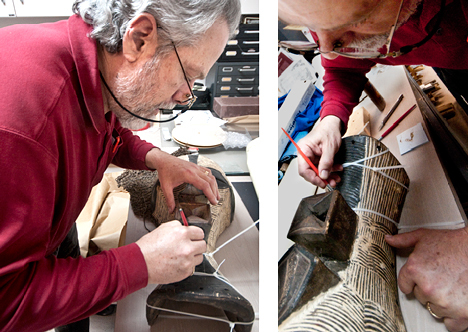 Concentrating like a surgeon, Dana Mitchell repairs a broken African mask. The wooden mask was bumped off its wall hanger in the exhibit gallery. Gravity, being no respecter of art, sent the mask to the floor with a resounding crack. A big piece of the neck along with chips and finish fragments were broken from the mask. The fix was on. 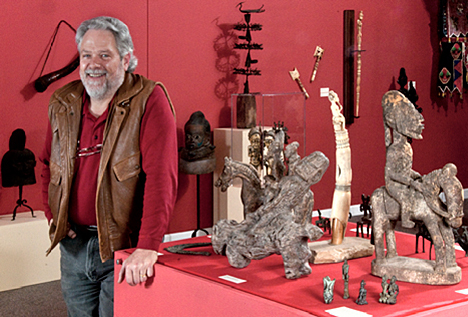 Dana Mitchell prefers that you concentrate more on the African art in his collection than you do on him. Considering the passion with which he collects art, it’s an uphill job to separate the man from his art collection and vice-versa. More than 250 pieces from his collection are on public exhibit at The Arts and Science Center for Southeast Arkansas in Pine Bluff. The story of Dana and his collection started on the Photo of the Week page at Corndancer dot com. To see other pictures on the Photo of the Week page and find out how all of this started, click here, a very cool thing to do. The process of repairing the well over 100 year old mask was an exercise in patience. Job would have been proud. Dana first collected the wood pieces which separated from the mask. The largest piece was probably four inches across. The smallest, well, suffice to say, tiny. Then he collected tiny fragments of the kaolin chipped from the white stripes on the mask you see above. Though Dana prefers to use only the tools which were available to the original maker when repairing his objects, this was an exceptional case, thus the zip ties you see as glue clamps. He reground the kaolin, added a bit of mother earth from a flower bed on the premises and proceeded to refinish his repair. The results were nearly invisible and a couple of people who did not know a crack was there, did not see the repair. The final step was burnishing the repair with his fingers. The mask is now hanging in its place in the gallery, looking as good as new, er, old. Dana Mitchell's collection includes tiny pieces, huge pieces and a lot of in-betweens. Each object in the exhibit has its own unique characteristics. While Dana adamantly denies being an “authority” on primitive African art, you could fool me. Every piece I asked about invoked a litany of interesting information from Dana tantamount to an audible version of Wikipedia. Although my earlier studies were in art, I’m not certain that I ever understood the functionality of this art in its original environment. I think I do now. 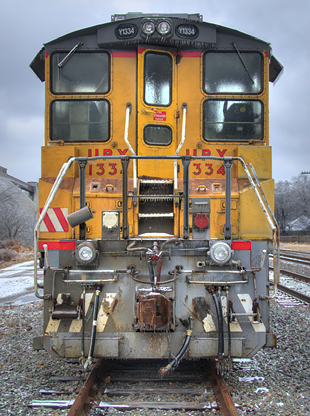 The uniqueness of this art is that unique functionality in its society; either utilitarian, spiritual, or as a necessary part of social traditions. It’s a matter of better understanding the world in which we live. 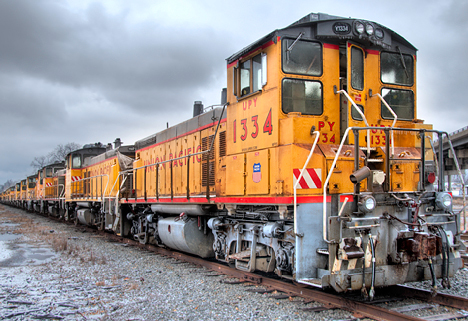 See higher resolution versions of the pictures here. The show goes on. What are you missing? 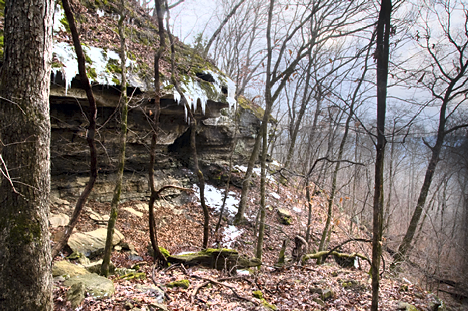 East of Winslow and West of Combs, Arkansas, in the big middle of the Ozarks we see a pristine winter vista unavailable in warmer months. The well-worn gravel road which meanders past this was, except for yours truly, unpopulated by vehicles. The absent drivers, unfortunately don't know what they missed. The view is south and the setting winter sun is to the right. Soon it will be dark. 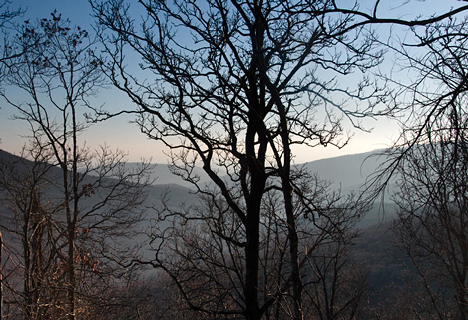 In winter months when trees are “nekkid,” Mother Nature reveals some stunning views she conceals during warmer months. Much of what you see is nature’s wild side, camouflaged when the weather is hot and sticky. We started this story on what you might be missing on the Photo of the Week page at Corndancer dot com. 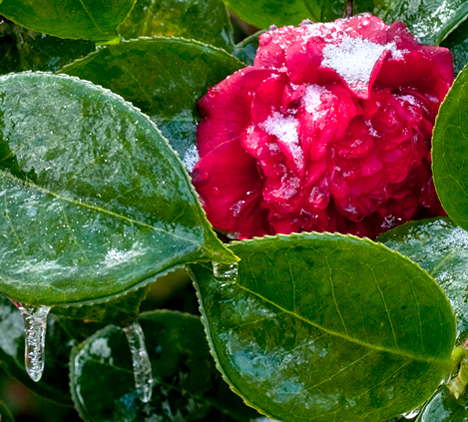 To see two other winter pictures with other prosaic meanderings, click here, a very cool thing to do. Back in February 2009, we found a similar set of circumstances in the woods of central Arkansas, near the Ouachita River. You can compare seasonal visions of the outdoors to the movements of a Dvorak symphony, or a Bach concerto. Each has its individual signature. Each stands on its own as a vital part of a greater creation. Each has its audience rewards. Missing a season is tantamount to arriving late at the concert or leaving early, both of which deprive one of the full experience. 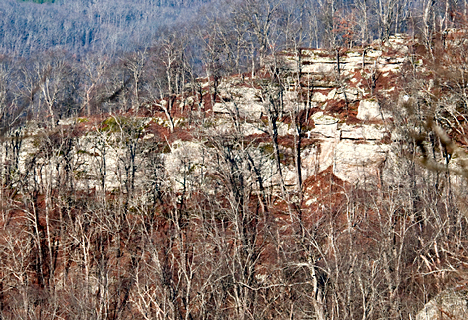 A bit further east, a rocky Ozark mountain bluff says, " ... look at me." Not a bad idea now. In four months, this will not be visible. The brownish spots are leaves shed from the mountain's population of oak trees. The bluff and the road are separated by a deep depression in mother earth, not visible when trees are fully clothed. I looked over the edge and decided to back up. The mountains are sparsely populated by people with an independent streak. They simply will not or cannot abide city life. Thank goodness. If these stalwarts abandoned the sticks, we would run out of barns to photograph in a few years. 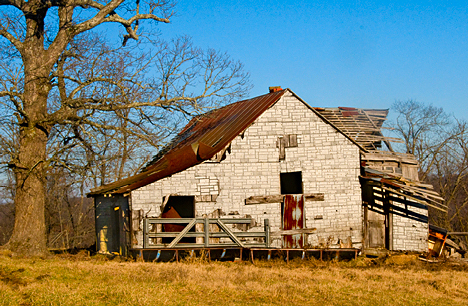 Now being used as a barn, I suspect this structure began its life as a home. Times got better, and the protagonists constructed new quarters. Sooner or later, the original domicile was recycled to "adaptive re-use" as a storage facility, or for all intents and purposes, a barn. On this trip, after these shots, the short winter days ushered in darkness at an exponential rate. I rolled back to the cabin satisfied that I had seen things observed only by a fortunate few. Not a bad feeling. 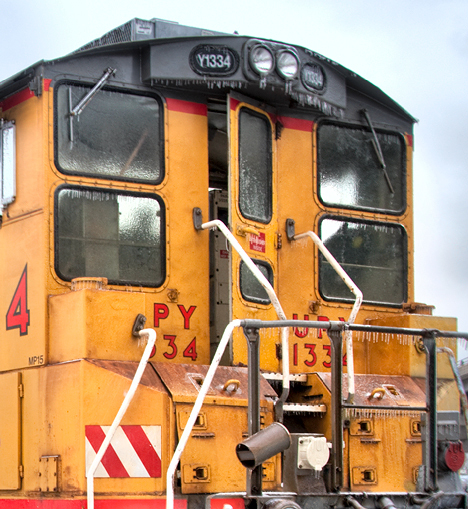 Sometimes, the photos on the blog loose a bit when uploading. Click here to see high resolution versions of all of this week’s pictures including the Corndancer shots which are just fine on that site, but heck, I included them as well. Also I gave the gallery a 2009 name, but that’s my first mistake this year (heh-heh). Wide angle distortion deceives you into believing these falls on Bidville Road near Winslow, Arkansas are not tall. The fact is, they are at least 20 feet tall and perhaps a bit more. Ice is forming in the pool and icicles have formed adjacent to the falls. A hike of a quarter mile or so across rocky terrain is necessary to see the falls as you see them here. 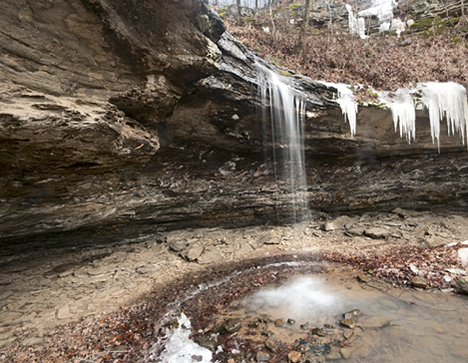 The story of these falls started on the Photo of the Week page at Corndancer dot com. To see another picture of the falls and formations close by, click here go to Corndancer dot com, a very cool thing to do. While exploring the territory where these falls reside, I had the good fortune of running into Eugene Provence, a lifelong resident of the area. His good advice helped me find the way to the falls. 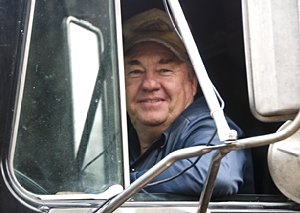 Eugene makes his living driving a truck over twisting, precarious gravel roads in this parts, the Boston Range of the Ozark Mountains out of Winslow, Arkansas. Eugene Providence skillfully drives this truck over twisting, turning mountain gravel roads which are far from the ideal venue for large trucks. I was taken aback when I first encountered the truck approaching a one lane bridge I was approaching from the opposite direction. 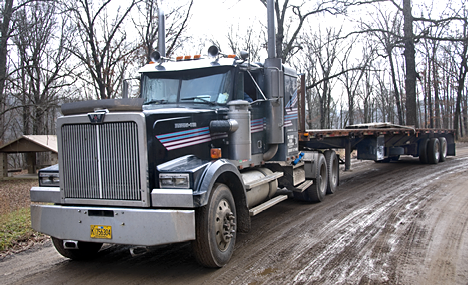 You simply do not expect to meet 18-wheelers this far back in the boondocks. Eugene Provence at the wheel of his big White tractor. Before the day was over, I met three of the Providence family including Eugene, his father, and a Provence nephew to boot. To the man, they were outgoing, friendly, and helpful. It is not often that one meets strangers out of the clear blue sky who put for such demeanor. Good upbringing I suppose. As you face the falls, to the right is a steep cliff, probably the height of a five story building. Bidville road runs not far from the drop off. Eugene said at one time a truck and trailer hauling a bulldozer went over the edge. It’s not a stretch of the imagination to see how that could happen. As you face the falls at the base, this bluff is to your right. The right of way for Bidville Road is not far from the edge. Icicles dangle from the edge. BRRRRRRR it was cold! This is looking down the bluff at the falls from the shoulder of Bidville Road. The white objects at the bottom center left of the picture are the ice formed in the pool below the falls. 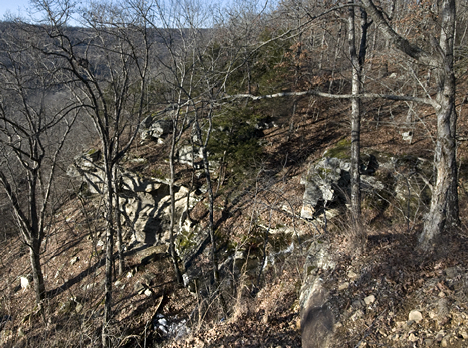 You can barely see the small cascades of water running down the bluff from the vicinity of the large rock to the right center of the picture. It is a long drop. As I was setting the tripod up at the edge of the road to get the shot above, Jason Provence, related to Eugene, stopped as he drove by to caution me about the bluff. I thanked him and told him that if he came back by in about 30 minutes or so and the truck was still there, but I wasn’t, to kindly extract what was left of me from the bottom. Fortunately, that was not necessary. 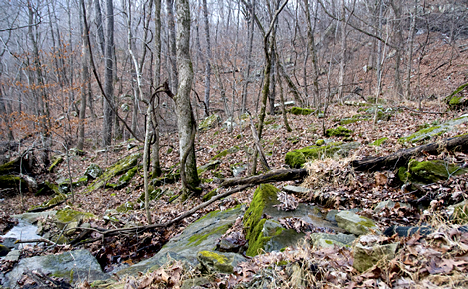 This terrain is at the approach to the falls as you hike in. It is typically replete with rocks, boulders and fallen timber knocked down by a severe ice storm last January. The low angle to the shot is due to the fact that yours truly is sitting on his back side after losing his footing, taking a dive and unceremoniously assuming that ground-level position. I figured as long as I was there I might as well record the event. The boondocks around Winslow and anywhere else do not go into hibernation and disappear when the weather turns cold and the leaves drop. It is a good time of the year to see things you won’t see when leaves are on the trees. I’ll have more to say about that in a later diatribe. Our headquarters for this foray was Sky-Vue cabins, just a mile or so south of Winslow on US Highway 71. A clean, well-lighted place with great breakfasts and gracious hosts.